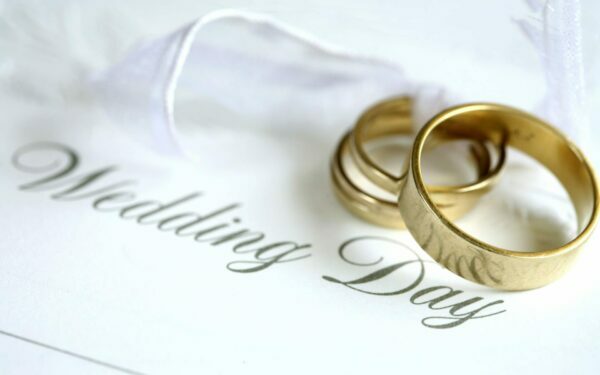 Do you have a big occasion coming up? Donate to the MSA Trust and make the celebration count that much more! Asking for donations instead of gifts is an inspiring way for family and friends to mark your special occasion and help our work. It could be the perfect alternative gift service for any celebration you have in mind – wedding, anniversary, retirement or birthday. Have our Wedding favour cards on the place settings or when you are thanking your guests after the wedding. Cards say that a donation was made to MSA Trust in lieu of favour. Buy the cards from our online shop. “I do” for MSA Trust! 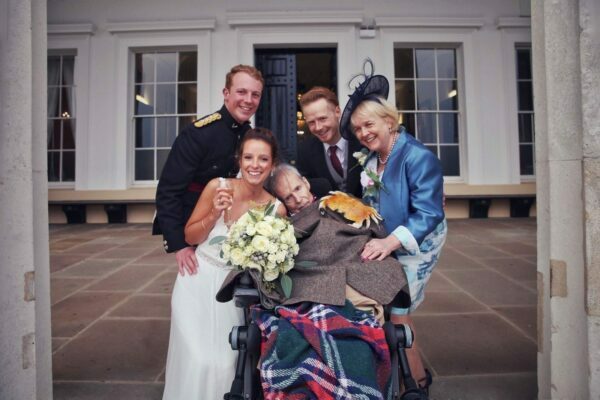 Here are two amazing couples who got married and raised a phenomenal amount for the Trust. This will go a long way in helping our work so a BIG thank you to the newly weds! Read more about them here. Michelle and Stephen got married in Nov 2017. Michelle’s father passed away from MSA at a very young age. She wanted to do something for a charity close to her heart so asked her guests to make a donation to MSA Trust for the wedding. This raised £5,600! Sam and Amelia also got married in Nov and accepted donations for their wedding. Amelia’s father has MSA and she was very blessed to have him walk her down the aisle. They managed to raise more than £3,000! Have a big birthday coming up – the big 30, 40 or 50? 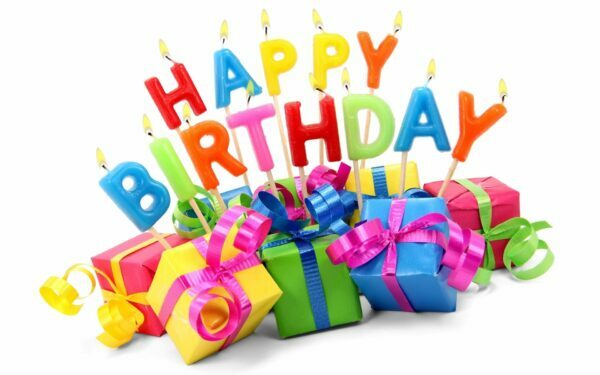 Accept donations made to the MSA Trust in lieu of birthday gifts. You can edit your page according to your birthday celebration with a background theme and pictures. Then create and post your invitation message. Email everyone to invite them! If you wish you can even post updates on your page as you get close to the big day. Christmas is the time of giving so say ho ho ho while you give to the MSA Trust! Instead of sending traditional Christmas cards think about a new way of giving. While we have some fantastic cards to offer each year, you can instead donate the money you spend on them. This ensures that more of your donation can be used to help our work. A few pounds in the name of each one of your loved ones and then you can let your friends and family know that a donation has been made in lieu of cards on their behalf! Remember the same can be done with Christmas gifts, where a donation can be made in lieu of gifts! Buy a few items from our shop to fill up your stockings! Living with MSA can be an isolating experience and is particularly hard during the festive season. Giving the gift of your time to someone with MSA, making them smile is a priceless way to give! 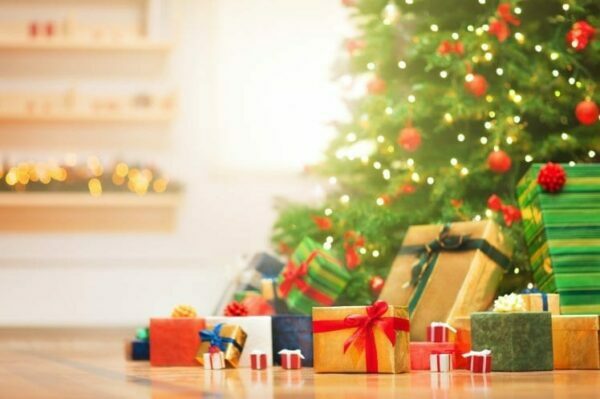 Any kind of celebration that calls for guests to bring presents is a great opportunity to donate to the Trust instead and help us in our efforts to fight this terrible disease. 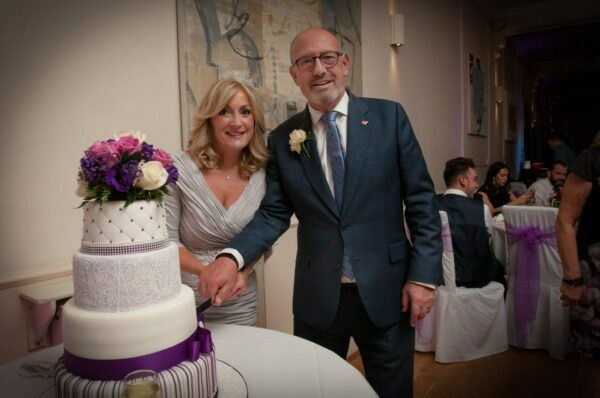 So an anniversary, retirement, Christening or just a regular dinner party are all great celebratory events as well. Fundraising support – we are here for you! Having a collection for the Trust while you celebrate your occasion is an easy and convenient way to raise vital funds for us. Find out more about collecting cash/cheques for the Trust here. Let us help you decorate your venue with some on brand Orange MSAT balloons and flags! Take a look at them here. Help raise awareness of a rare condition like MSA by distributing these leaflets at your event. We can also provide these lovely “Thank you for attending cards” free of charge. Have them around on the place settings or send them to your guests after the event. 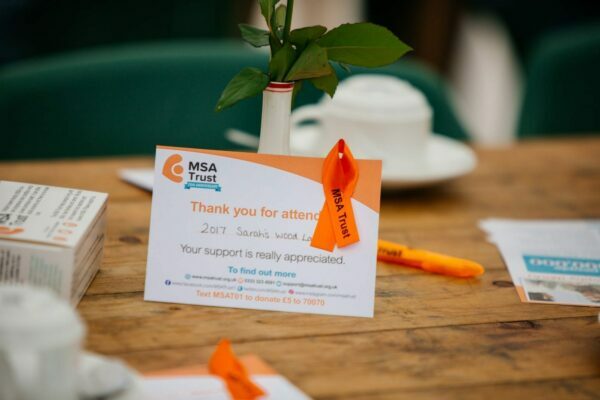 Information about MSA and the Trust on reverse so you are raising awareness there as well! Email fundraising@msatrust.org.uk and we can arrange to have the cards and/or any other fundraising materials sent to you.